The Liberals released audio they allege is of Ford trying to sign up people to vote for Kinga Surma, but telling them they don't have to pay. 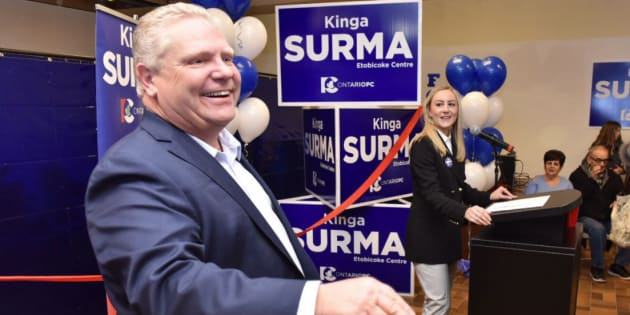 Ontario PC Leader Doug Ford is shown with candidate Kinga Sirma in a photo from Ford's Twitter account. TILLSONBURG, Ont. — A campaigning Progressive Conservative Leader Doug Ford dismissed allegations Thursday that he was involved in selling bogus party memberships, and also denied trying to intimidate a would-be candidate. Speaking at an event in a factory in a Tory stronghold in Tillsonburg, Ont., Ford attributed the accusations — based on an audio recording and affidavits — to a desperate attempt by the governing Liberals to hang on to office. Ford, who became party leader this year, said the two-year-old incidents at issue were put to a party appeal process at the time. "The appeal was totally dismissed," Ford said "This is the Liberals two weeks before an election trying to change the channel on their mismanagement, scandal and waste." The Liberals alleged that Ford tried to sign up people to vote for Kinga Surma, a former staffer in his late brother Rob Ford's administration at Toronto city hall, who was running for a Tory nomination. According to the Liberals, Ford told the potential supporters they didn't have to pay for a party membership — a violation of party rules. The Liberals provided an affidavit from the woman running against Surma for the Etobicoke-Centre nomination in which she says she encountered several people on the membership list who maintained they had not signed any forms or paid any fees. Ford had, however, invited them to the nomination meeting, according to the affidavit from would-be candidate Pina Martino — an interim chief of staff for former Tory leader Patrick Brown. The allegations were sent to the party in 2016. Martino also alleged that Ford intimidated her by following her home, but Ford denied those accusations. "No, that never happened," he said. Audio played at a Liberal news conference Thursday was from a man who saw Ford at a Tim Hortons in 2016 and pressed record on his phone, the party said. "It doesn't cost you anything," Ford is heard saying to a person he and Surma were trying to sign up. Surma won the nomination. Ford did not deny the authenticity of the recording, nor that he told potential members they wouldn't have to pay if they signed up to vote for Surma, but he did deny paying for anyone else's membership. Progressive Conservative party memberships cost $10 per year and the individual signing up must pay for it. Messages left by The Canadian Press seeking comment from Surma's campaign have not been returned. Liberal campaign co-chair Deb Matthews said paying for someone else's membership could violate election laws against making secret donations and possibly put someone over the donation cap. Liberal Leader Kathleen Wynne called the allegations "very serious" and said Ford needs to address them. "The whole issue of the concerns around breaches of a process that should be fair and should be open and democratic worries me," Wynne said. For her part, Andrea Horwath, whose New Democrats are running neck-and-neck with Ford's Tories according to latest polls, said Ford has a lot to answer for. "It's time he step up and talk to Ontarians about exactly what role he's played in these nomination meetings," Horwath said in Toronto on Thursday. "There's all kinds of accusations of wrongdoing." Ford has pledged in recent days to act swiftly if evidence of wrongdoing by candidates surfaced. He made those comments after a Tory candidate resigned following accusations he was involved in an alleged theft of customer data at a toll highway operator. The PC leader has said the party is looking into whether the allegedly stolen 407 ETR customer data may have been used by some candidates to win nomination races.